In a medium bowl, whisk the flour with the baking powder and salt. In a standing mixer fitted with the paddle, beat the butter with the shortening until smooth. Add both sugars and beat at medium speed until fluffy. Add the molasses, egg and vanilla and beat until smooth. Add the dry ingredients and beat at low speed until incorporated, scraping down the side and bottom of the bowl. Pat the dough into a disk, wrap in plastic and chill until firm, at least 1 hour. Preheat the oven to 350° and line 3 or 4 baking sheets with silicone mats or parchment paper. Arrange the oven racks in the upper and middle thirds. On a floured surface, roll out the dough 1/4 inch thick. 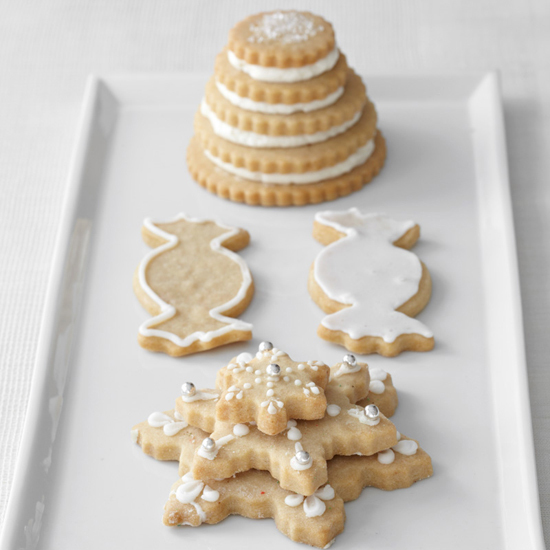 Using a 2- or 3-inch cookie cutter, stamp out as many cookies as possible and arrange them on the baking sheets 1 inch apart. Gather the scraps, reroll and stamp out more cookies. Bake on the upper and middle racks of the oven for about 18 minutes, until the cookies are firm and lightly browned around the edges; shift the pans from top to bottom and front to back halfway through baking. Let the cookies cool completely. In a bowl, whisk the confectioners' sugar with the egg whites and lemon juice until smooth. Fill a pastry bag fitted with a tiny, plain tip with half of the icing. Pipe a border of icing all around each cookie. Thin the remaining icing in the bowl with a few drops of water. Spoon a little of the thinned icing within the borders and carefully spread it to the edge. Decorate with sprinkles and let the icing set. Transfer the cookies to a platter and serve.